“Do you like beets?” This question generally gets a reaction, whether it’s people turning up their noses and scrunching up their faces in disgust, or smiling and salivating with glee. There is a true divide in taste buds in regard to this root. I have found no middle ground. You like them or you don’t — end of story. I like them and I like them a lot. As one of my favorite vegetables, the beet flavor evokes sweetness and earthiness, with a smooth, rich texture. Baby beets, when prepared properly, taste like earthy candy. Beets are versatile. They can be incorporated into baked goods, soups and salads. They can be pickled, sautéed, juiced, roasted and grilled. If you decide to grow beets, they are a foolproof crop. You plant seed into the soil and in about 50 days you will have edible produce. They like sunshine; the seedlings will need to be thinned and watered regularly. Continue to sow beet seeds throughout the growing season so your supply is staggered and always available. Also, beets are easy to store for the winter season. Cut off the greens, pack the beets into a zipper storage bag, and store in the refrigerator for up to four weeks. They are versatile and can be frozen, pickled or canned to enjoy later. Beets are at the top of the charts in nutritional value as well. The green tops are extremely high in vitamin C and iron. They are awesome when tossed in a salad or incorporated into your favorite smoothie or fresh juice. As always, the highest nutritional value is captured when eaten raw. The beetroot is also very nutritional, high in vitamins A and C and, similar to carrots, high in carotenes. Raw beetroot can be shredded into your favorite salad or coleslaw to add color and flavor. My favorite part of beets, outside of the tastiness and nutritional value, is their beauty. 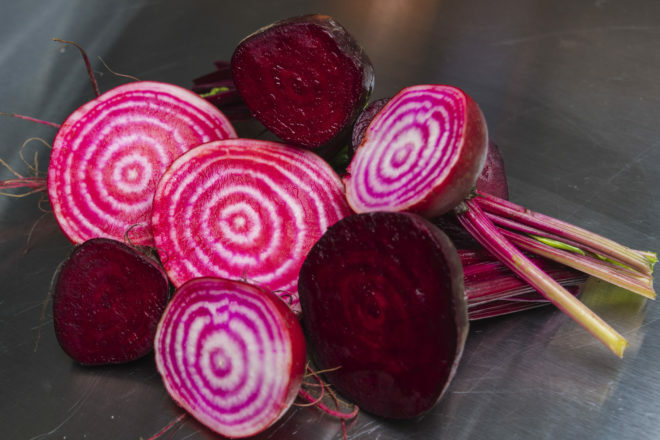 They come in many varieties: Chioggia — striped white and red on the inside; Golden — round and yellow like the sun; Albino — white like a parsnip; and many more traditional red varieties ranging from bright red to deep, dark red flesh with names like Detroit Dark Red, Bull’s Blood, Early Blood and Cylindra. The flavor varies but the sweetness is there throughout them all. 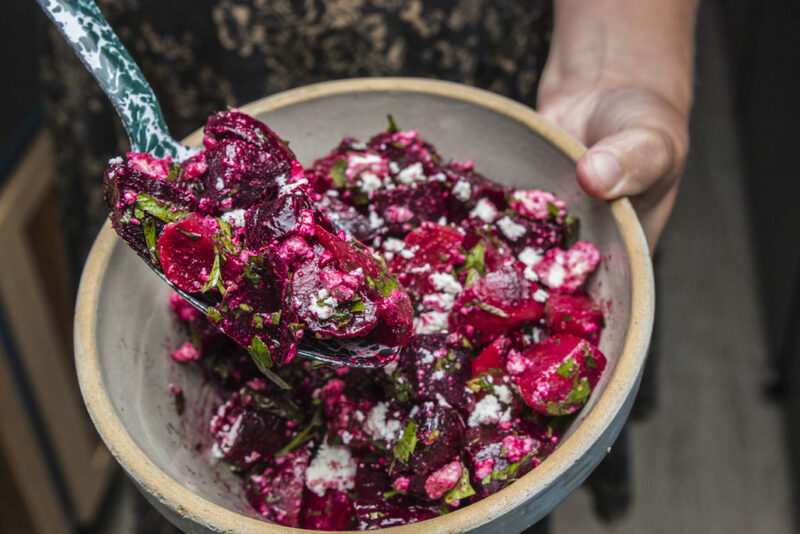 Beets can be prepared so many ways. Give them a try. Don’t be a hater. Be prepared for your mind to be blown and your taste buds awakened! Beets stain. The red varieties of beets will stain fingers and cutting boards (especially wood). I have learned to wear gloves and cut on a parchment paper-lined workstation. When consuming beets your urine may turn pinkish red. This is perfectly normal and will run its course. No need to rush to the emergency room! Delicious paired with grilled beef or on a bed of greens, accompanied by your favorite blue cheese and a little red onion. Heat a skillet (I prefer cast iron) to high heat. Add the olive oil. Once the oil is hot, add the whole beets. With tongs, toss the beets continuously for approximately three minutes. Add the garlic and toss for another minute. Remove skillet from the heat once the greens have wilted and the beetroots have softened. Add a drizzle of the balsamic glaze and finish with a sprinkle of toasted pine nuts. Salt and pepper to taste. Preheat oven to 375°F. In a shallow baking dish, coat the beets in olive oil and sprinkle with salt. Bake in the oven for 45 – 60 minutes, until the beets are fork tender. Remove from heat and set aside until they’re lukewarm. It is easiest to remove the skin when the beets are still warm to the touch. Gently rub your thumbs on the beetroot; the skin will loosen and can easily be removed. Discard the skin. Chop the beets into approximately ½-inch pieces and place in a mixing bowl. Make the dressing while the beets are cooling. Place the dressing ingredients in a jar, screw on the lid and shake until the dressing is emulsified. Let the dressing sit for approximately 15 minutes so the flavors can meld. Give it a quick shake before you drizzle over the beets. To finish, add feta along with salt and pepper to taste. Serve this salad cold. It makes a great side dish or can be a great companion to a soup and salad dinner paired with a slice of crusty bread.